Q1) I have a swarm of bees in my garden what should I do? Call the Wiltshire Beekeeper immediately on 07974 108625, keep children and pets away, shut windows and doors nearby, inform your neighbours, do not try and deal with the situation yourself using chemical sprays, hoses, water, smoke or noise, you could be in a lot of danger. Bees attack when they are frightened or upset so leave them alone. Q2) How many honey bees are there in a hive? A full colony in late spring might contain 80,000 to 100,000 bees, at other times there might be as few as 35,000. Q3) How far can honey bees fly? Honey bees can fly up to 10 kilometres from their hive in search of food when food is scarce but usually only fly 1 or 2 kilometres and forage on flowers. Q4) At what speed do bees fly? Bees can flap their wings 1400 times per minute and fly at an average speed of 25 kilometres an hour. Q5) How do bees make honey? Flowers contain nectar, a sweet sticky liquid, the bees collect it and mix it with secretions from the glands in their mouths. Bees from one hive might visit 250,000 flowers in one day. When they return to the hive they store the nectar in honeycomb. They fan the honey to reduce the water content by making it evaporate. 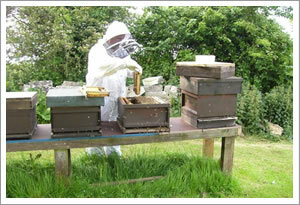 Then they seal the honeycomb cells with a layer of wax, this sealing activity is called "capping". Q6) How long does honey last? Once capped in the honeycomb, honey will last indefinitely in its natural state. Q7) Is it true that a bee dies after it has stung someone? Yes, unlike wasps, a honey bee can only sting once. It leaves it's sting and venom sack in it's victim, the sting continues pulsating and pumping poison for about a minute and a half. 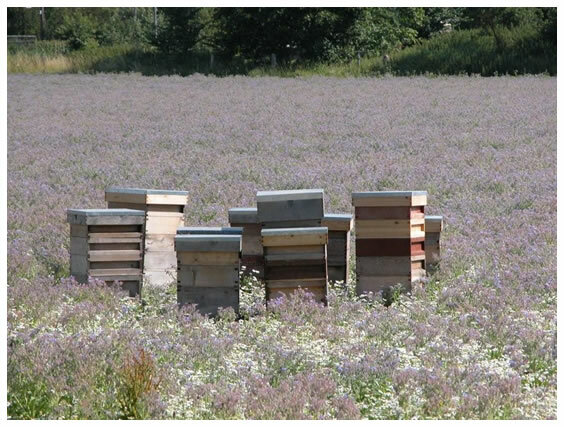 Q8) Is it true that eating local honey will help to alleviate hay fever? It is thought that eating honey from within 5 kilometres of where you spend the greater part of your day, has a beneficial effect on the symptoms of hay fever. Q9) What do bees do for us? Bees are the only insect which provides us with food (honey) and bees perform approximately 80% of all crop pollination. One third of our food is produced through pollination. Honey has been used for thousands of years as a topical dressing for wounds since microbes (germs) can not live in it. The venom from honey bees is used to treat a variety of ailments. Honey and the other products from the hive which are important to us such as pollen, royal jelly, propolis and beeswax, are used in the health food and cosmetics industries. Q10) How long have people been keeping bees? Beekeeping was practised in ancient Egypt as early as 2500 BC and cave paintings which show beekeeping have been found in Spain and date from 7000 BC. Honey produces hydrogen peroxide and has even been used to embalm bodies such as Alexander the Great. In ancient Eqypt and in Rome taxes were paid in honey instead of gold. In early Greece and Rome honey symbolised fertility youth and beauty. In the Bible this sublime nectar is called the heavenly food. Man has been collecting honey from honey bees for the last 9000 years.